Stocks end the week, the month and the quarter on an up note. Equity trends are mixed while bond trends are up. Conference Board confidence turns down. The ratio between the leading and coincident indexes is narrowing. Q4 growth is revised downward. Trump makes a bad political move on healthcare. US stocks were up by 1.35% for the week and finished March up by 1.42%. For the first quarter, US stocks advanced by a blistering 14%. International stocks were up by 0.96% on the week, 0.77% for the month, and 10.3% for the quarter. While the markets had a spectacular 1st quarter, the last few weeks there has been a lot of back and forth between the ups and the downs. This week was positive. The markets finished the week in good shape technically. The VTI held above the support line. And on Tuesday we got a golden cross, that is when the 50-day moving average crosses above the 200-day moving average (see point 10 on the chart below). However, as the table below illustrates, the trend in the equity indexes (VTI – US overall stock market, SPY – S&P 500, and VXUS – international stocks) are mixed. Compare that to the trend for bonds as measured by the AGG which are all positive. 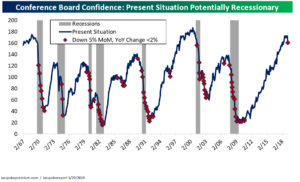 While the stock market finished the week strong and had a spectacular run in the first quarter, the economic signals are still pointing to a slowdown and a possible recession down the line. 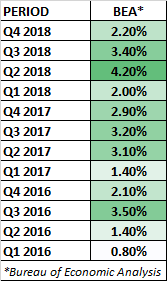 Q4 growth came in at 2.2%, lower than the original 2.6% estimate (see below). 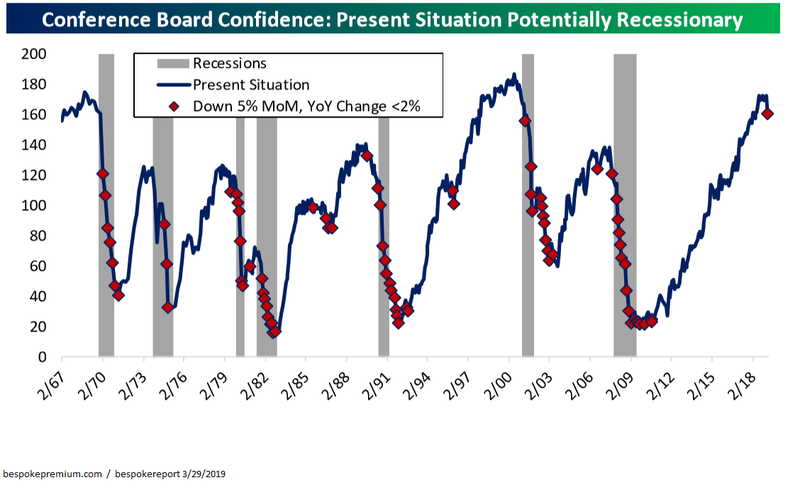 The Conference Board Consumer Sentiment Survey has turned down, in the past, that has often been a precursor to a recession. 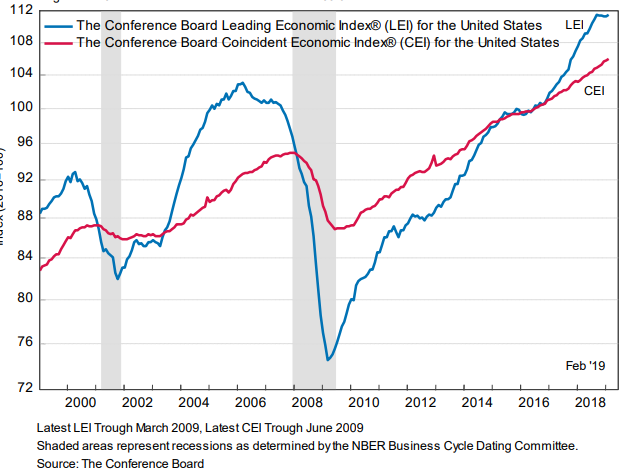 Another negative signal from the Conference Board is the ratio between the Leading Economic Index (LEI) and the Coincident Index (CEI). 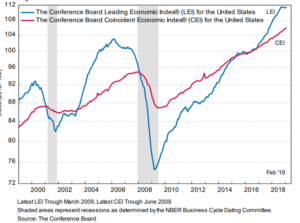 On the chart below the LEI is flattening while the CEI continues to increase. While still early, a declining LEI and an increasing CEI have in the past been a leading indicator for a recession. But not everything is negative. There are some positive signs. Jobless claims fell again, dropping to 211,000. Central banks around the world, including the Fed, have turned dovish, and are not increasing rates. It is possible that the banks are making the turn just in time to forestall a recession. With the fall in interest rates, new home buying is increasing, that will have a positive multiplier effect on the economy. Declining interest rates are now a factor in higher equity values. Declining rates will increase the value of future cash flows, and all other things equal, that increases the value of stocks. Lyft went public on Friday at $72 per share, which was at the top end of the expected range and closed up by 9% for the day. GDP growth for Q4 was revised downward to 2.2% from 2.6%. Corporate profits after tax adjusted for inventory valuation and capital-consumption showed no growth in the quarter. Consumer, businesses, and local and state governments spent less than was originally estimated. On the positive side, growth in exports was revised higher and business investment contributed 0.73% to the 2.20% growth. The Trump administration put in a legal request to strike down the Affordable Care Act (ACA). This does not seem like a good electoral strategy for the Republicans and it unleashed some dissent in the Republican ranks. Trump and the Republicans have offered no alternative to Obamacare, and this move plays into the Democrats hands. Given the extreme left-wing tilt by the Democratic party in recent months, many centrist voters that detest Trump, and who would have been happy to vote for a traditional Democrat, have been realizing that the left-wing Democrats will be forcing them to make a vote they don’t want to for Trump. And then Trump makes a move like this that will swing some voters back to the Democrats. Playing to the center, keeping the ACA intact and building around it would be the much smarter approach for the administration. Americans don’t want to lose their insurance, and they don’t want higher premiums. To eliminate the ACA without even an alternative does not make sense. This entry was posted in Uncategorized by Bruce Konners. Bookmark the permalink.